'I represent a generation. Disqualifying me is disqualifying an entire generation of Palestinians," Knesset Member Hanin Zoabi said Wednesday, in a hearing of several motions filed with the Central Election Committee, to have her disqualified. Zoabi spoke prior to the hearing, which also saw motions to stop her party, Balad and the United Arab List-Ta'al Party from running in the upcoming elections. Political analysts said that the Election Committee is likely to grant the motions, in which case the issue of disqualification will be brought before the High Court of Justice. Balad's Knesset members shunned the hearing, calling it a "pathetic circus." "Only a small minority of my generation believes in the Knesset as a instruments of fighting for democracy, but I represent those who still do. This disqualification process intensifies the dissonance between the Palestinians and the state's establishment and therefore a High Court ruling on the matter is a crucial step towards true democracy," Zoabi said. She further said that "I had no idea I will go through three years of delegitimization. Those who turned me and Balad into a punching bag should be prosecuted. In a democracy you argue with those who disagree with you but in this Knesset, minority rights have no meaning, which means only one thing – the victims are democracy, leftist and human rights organizations and academics." 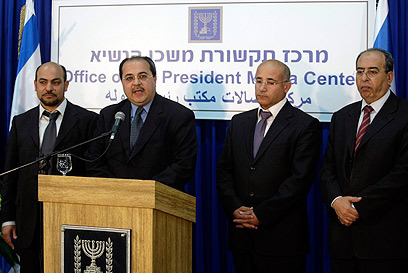 Zoabi warned that "They start with me and then slowly but surely destroy democracy." Knesset Member Arieh Eldad (Otzma LeYisrael) said: "I'm a doctor and I believe in preventive medicine. There is no need to convict a person of treason before disqualification." Knesset Member David Rotem (Yisrael Beiteinu) said: "Blad supports terror from Gaza." As for the accusations against her, Zoabi replied: "My problem is I'm not a terrorist, our problem is we are democrats in a non-democratic environment. This Knesset never forgot I'm both a woman and a Palestinian and it was used against me in the worst chauvinistic way." Knesset Member Jamal Zahalka (Balad) said: "We will not apologize for demanding full equality in Israel. We will not be prosecuted for being patriotic Palestinians and for believing in true democracy." Zahalka said he will appeal the High Court of Justice in case Zoabi is disqualified. "We will not let far–Right parties dictate who will represent us at the Knesset. If Zoabi is banned I will quit as well and call the party to avoid the election." Zahalka added. See all talkbacks "Zoabi: Knesset bans entire generation of Palestinians "